The Romanian Orthodox Church is considering a Romanian monk persecuted by the communists and known as the “saint of Transylvania” for sainthood. … Boca, who became a monk in 1940, was harassed by the Securitate secret police, detained and did forced labor on the Black Sea Canal, a notorious labor camp where tens of thousands of political prisoners worked in the 1950s. In 1959, he was banned from leading worship and the Prislop monastery, where he is now buried, was converted into a retirement home. 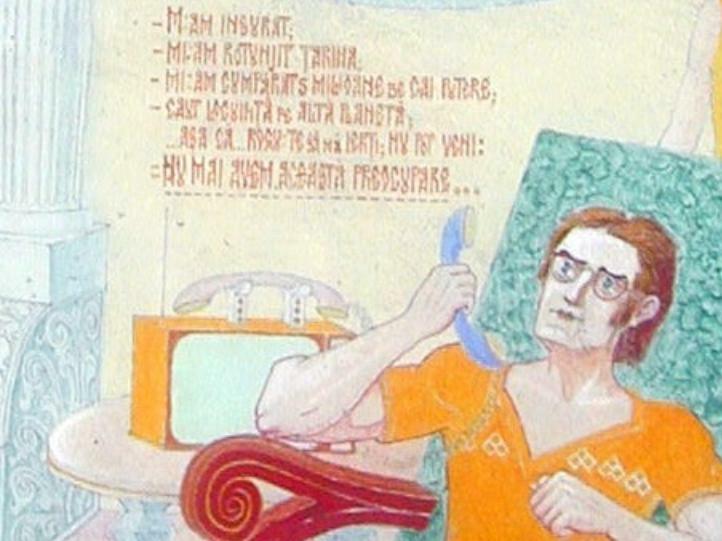 He was forced to retire from the church in 1968 and spent 15 years painting religious images and icons in the small church of Draganescu in southern Romania. The church’s interiors are now considered among the most beautiful in the country. Elder Arsenie Boca reposed in the Lord in early 1989, a month before Romania’s anti-communist revolt, aged 79. 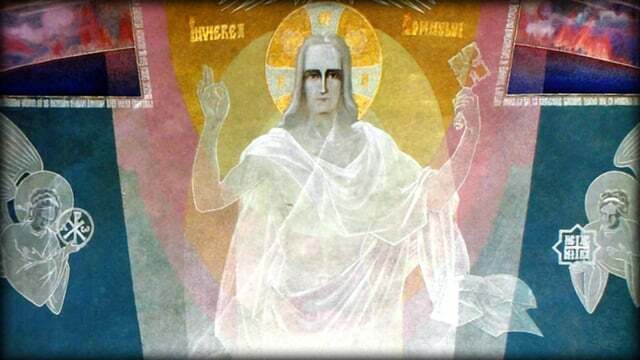 Though he is not yet canonized, Elder Arsenie’s grave, located in Prislop Monastery, is visited by tens of thousands of pilgrims every year, where many miracles occur. One miracle which everyone can see is that the flowers over his grave never die or wither , neither in the hot summer or the frigid winter. For his amazing life, the documentary “Fr. Arsenie Boca – Man of God” is a MUST. “His colleagues at the Theological Academy of Sibiu named him ‘The Saint’, he is considered a founding father of the Romanian Philokalia by father Dumitru Staniloaie, who thought of him as an unparalleled phenomenon of Romanian monasticism. 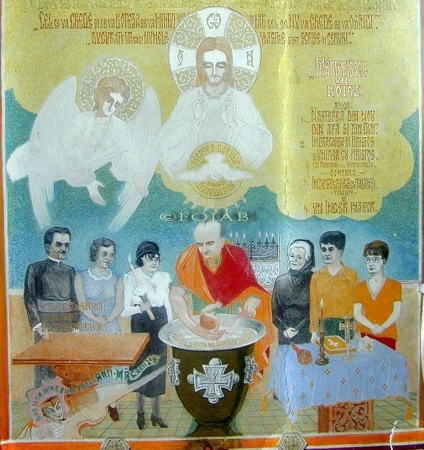 Sought after and followed by thousands of believers eager to quench their spiritual thirst from his inexhaustible spring of serenity; legendary for his prophesying and healing gifts, painter of souls and painter of churches, man of culture, philosopher of sciences and religion, father Arsenie Boca was, just like Saint Basil as depicted by him in his essential work The Path of the Kingdom. 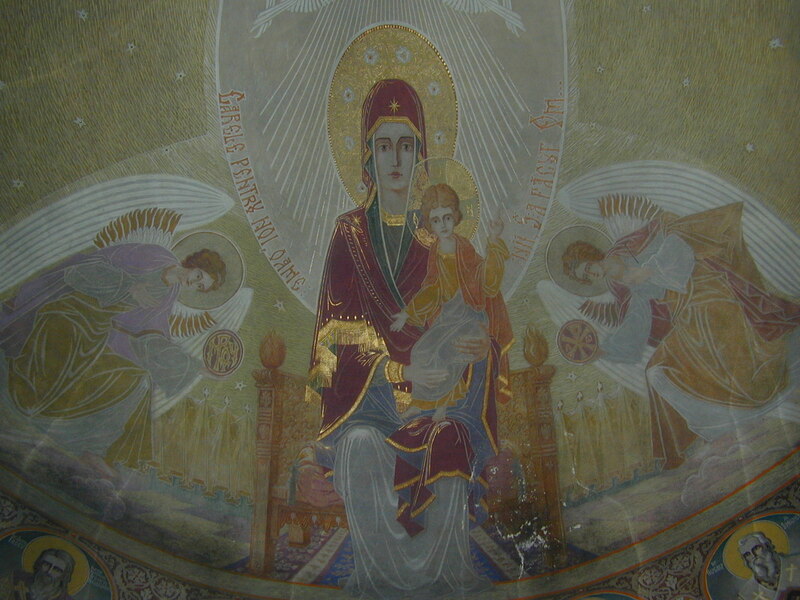 Father Arsenie Boca lived in Draganescu for 20 years and in 1968 he began painting the parish church, a work that took him more than 15 years. 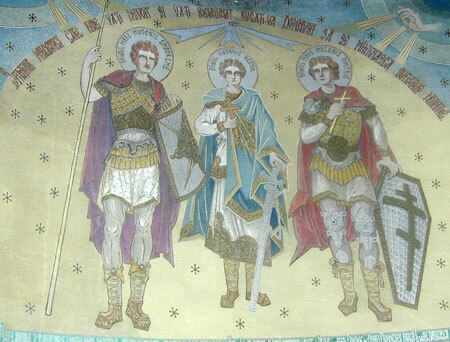 As he wasn’t allowed to celebrate service, some of the priests who visited the church over the years claim that Arsenie Boca has actually painted the sermons he delivered at Sambata de Sus. 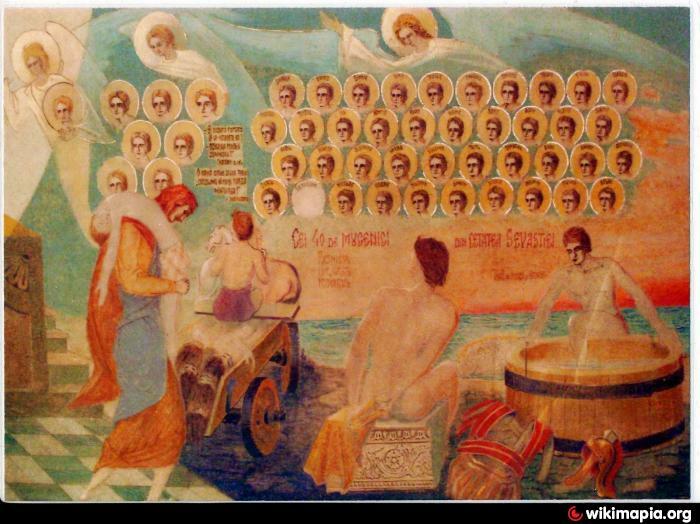 His frescoes are diaphanous, and the images are accompanied by metaphors referring to people’s weaknesses and sins, by aphorisms, quotations from the Holy Scripture, sometimes by teachings of the Father and biblical scenes: the Resurrection, a picture of hell, the Group of the Righteous. 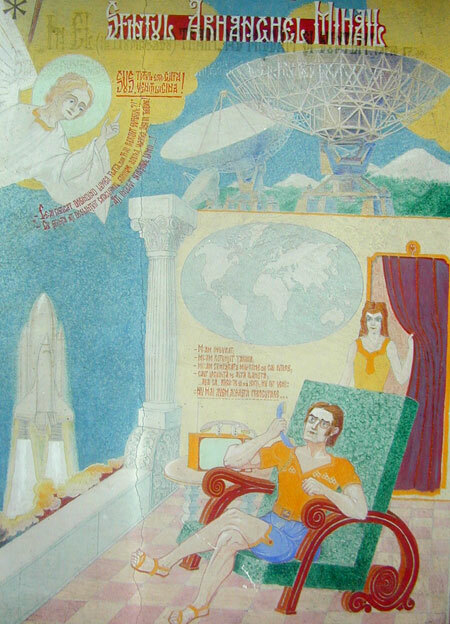 The paintings are said to have a visionary, prophetic content, as it is known that Father Arsenie Boca had the gift of spiritual far-sight: one of the scenes, two tall buildings engulfed in flames, is said to allude to the 9/11 attack on the Twin Towers, not to mention those where items like a cell phone, a space shuttle, satellite dishes, all unusual things in that period, appear. For his paintings, the art documentary “Picturi ale pr. Arsenie Boca pe biserica din Drăgănescu” at https://vimeo.com/82791105 is a MUST. 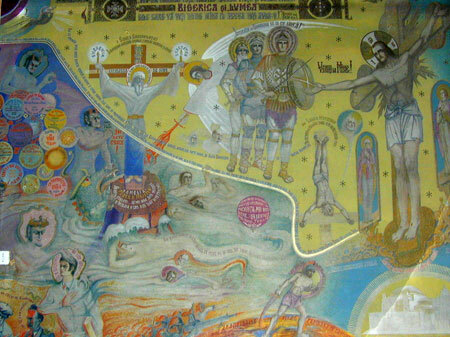 Also, go to http://www.themidlandhostel.com/the-sistine-chapel-of-the-romanians-the-draganescu-church/ and http://www.agerpres.ro/engleza-destinatie-romania/2014/11/22/destination-romania-the-draganescu-church-swathed-in-father-arsenie-boca-s-prophetic-paintings-18-04-37 and watch a short art film “Father Arsenie Boca, one of Romania greatest Saint” at https://www.youtube.com/watch?v=5r6ZX8M8vwY. Lord Jesus Christ, help me let go of myself today, as I can create great problems from small and insignificant issues, and this way, caring for myself, I will lose You. Lord Jesus Christ, help me so that the prayer of Your Holy name will wander (work) through my mind more than lightning on the sky, so that I stay clear of even the shadow of bad thoughts as, look, I am sinning every minute. Lord, coming secretly amongst people, have mercy upon us, because we stumble as we are walking in the dark. Our temptations are closing the eyes of our mind, forgetfulness has become like a wall amongst us, turning our hearts to stone and all together have made the prison cell in which we keep You crippled, starving and naked, wasting our days. Lord, coming secretly amongst people, have mercy upon us and set fire to this prison cell, light up the love in our hearts, burn the thorns of our temptations and make our souls bright. Lord, coming secretly amongst people, have mercy upon us, come and live within us, together with the Father and the Holy Spirit. The Holy Spirit prays through us with unspoken sighs, when word and mind don’t have the power. Lord, coming secretly amongst people, have mercy upon us, because we don’t realise how imperfect we are and how close You are to our souls; and how distant we become through our sins. Shine Your light over us, so that we see light through Your eyes and live eternally through Your life. Our light and joy, praise be to You!